Sleep has a critical role in brain health and is an essential part of improving neurologic care for all of our patients. 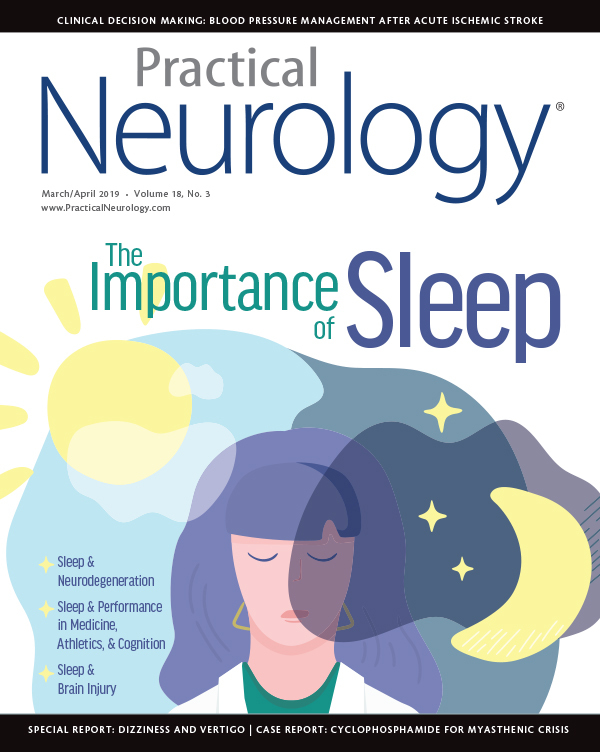 In this issue, we’re excited to bring you a new perspective on sleep as it relates to brain health and patients’ wellbeing throughout their lives, rather than focusing on specific sleep disorders. Perhaps more important is our growing awareness of sleep as not only a biomarker of neurologic disease but also a critically important player in brain function. Regardless of where your patient is—conquering on the gridiron or convalescing on the ward—sleep is fundamental to ensuring that the body and mind are doing their best. In fact, sleep is so pervasive and so profound to our patients’ lives that gauging sleep quality should be incorporated into gathering of all vital signs. For this reason, we have gathered the perspectives of a host of expert sleep neurologists to provide insights into how sleep can improve neurologic care. A perspective on the earliest sleep developments is provided by Dr. Morse and focuses on complex processes that underlie the crystallization of healthy biorhythms. This review addresses how healthy sleep from birth on sets the stage for healthy sleep over the lifespan and how that may unravel in the face of neurodevelopmental disorders. At the other end of the spectrum Dr. Malhotra provides a perspective on the concomitant changes in sleep and neurologic function in late-life. With a particular focus on sleep and circadian disruptions in conditions with accelerated neurodegeneration, we begin to appreciate the intricate interplay between brain health and sleep. We then turn our focus to performance. Dr. Kutscher provides a review of sleep optimization for promoting physical and mental prowess in individuals at the top of their game. This is complemented by an interview with Dr. Basner discussing how prioritized sleep is key to preserve and promote peak neurocognitive performance amidst the encroaching demands of our daily lives. Given the current concern over resident physician and neurologist burnout and the vacillation of the ACGME’s workhour requirements, Dr. Howell provides valuable and timely insights and guidance on best practices for healthy sleep while in training. Even with the best advice, however, sleep is unfortunately not something that’s easier to do the harder you try—a potentially despairing thought for individuals attempting to feel and perform their best. Dr. Barwick weighs in on the underpinnings of sleeplessness and the inevitable psychosocial aspects that can precipitate and perpetuate sleeping difficulties.This provides a framework for understanding the bidirectional interaction between sleep and neuropsychiatric disorders, outlining screening and treatment strategies that address the clinical overlap. We also highlight the growing interest in sleep’s role in resiliency and recovery among special healthcare populations. In an interview with Dr. Jaffee we hone our focus in on acute neurologic injuries in particular. Understanding the relevance of sleep as not only a symptom of brain injury, but also a therapeutic tool in the healing process, underscores how vital sleep is in the lives and treatment plans of our patients. Finally, as our understanding of the underlying mechanisms of sleep and wake has matured, our armamentarium of therapies has grown to include treatments focused on physiologic pathways rather than blanket neurotransmitter activation or inhibition. This is quite an exciting time in sleep medicine as there are a host of novel therapies and new pharmacologic agents in use and in the pipeline that will help target our treatments to patient-specific needs. Whether it’s the seemingly checked box of obstructive sleep apnea treatment or the uncharted waters of daytime fatigue and sleepiness, the overview on the state of the science from Dr. Sala and her colleagues might alert you to something you didn’t know about. Ultimately, I hope you find at least one thing that can improve the sleep and brain health of someone in your life, be it your patients, your trainees, or you! When patients are refractory to first-line treatments for myasthenic crisis, cyclophosphamide may have benefits and warrants further study. Convention Question: What Will Drive the Next Great Advance in Stroke Treatment? Answers from attendees of the International Stroke Conference in Honolulu, HI, Feb 6th-8th, 2019. CLINICAL DECISION MAKING: Managing blood pressure after acute ischemic stroke requires different approaches before and after reperfusion. New treatments hold promise of increasing efficacy with precision medicine. There are knowns, unknowns, and bogeymen. Elite athletes commonly have sleep disturbances and poor sleep quality made worse by the environmental demands of athletics.